Can you really say you have started traveling when you haven’t actually been to Hong Kong? For many Filipinos, stepping into the pearly gates of Hong Kong was their initiation to a lifetime of wanderlust and adventure, their peek of what the world might look like outside of their norm, or maybe just the day that led them to meet Mickey Mouse for the first time. For whatever reason, this tiny territory south of Mainland China is a must-visit! In this travel guide series, I will virtually take you to Hong Kong and demystify what attracts millions of travelers year after year. More than just being a major financial hub, Hong Kong has tons to offer – maybe more than what you can think of. The blending of its Chinese heritage and the decades of British influence has positioned Hong Kong as an attractive travel destination for so long. Before you even dream of a magic carpet ride to Hong Kong (Disneyland reference), make sure you have the necessary entry requirements just like any other overseas trip. A vast number of nationalities can enter Hong Kong (SAR China) visa free. In particular, Philippines passport holders may visit Hong Kong visa free up to 14 days. For a complete list of nationalities and the visa requirements, you may refer to the website of Hong Kong’s Immigration Department here. Want to know where else can you enter visa-free with your Philippine passport? Check out this blog post: Where can your Philippine passport take you? With a subtropical climate, probably the best time to travel to Hong Kong would be in Autumn, that’s around October to early December, when the weather is sunny but cool – perfect for going around and about. While it doesn’t snow in Hong Kong, the weather can get very chilly around mid-December to February as Winter kicks in. Best to pack warmer clothes like jackets, sweaters or even coats. As Spring begins in March, the temperature starts to rise but evenings can still be cool. The typhoon season in Hong Kong starts in May which may cause some shops to close down or flights to get canceled. Just like elsewhere, Summer in Hong Kong can get very hot and humid. Pack appropriate attires for the beach or the mountains, and don’t forget sunscreen! It is incredibly easy to find direct flights to Hong Kong. Daily direct flights are available from Manila with Cebu Pacific, Cathay Pacific, Philippine Airlines, AirAsia and Hong Kong Airlines. Daily direct flights taking off from Cebu are also available thanks to Cebu Pacific and Cathay Pacific. Cathay Pacific is Hong Kong's official flag carrier. Book your flights now. After a good two-hour, hopefully calm, flight from Manila, your aircraft will touchdown at the runways of the massive Hong Kong International Airport – the primary hub for Cathay Pacific, Cathay Dragon and Hong Kong Airlines. 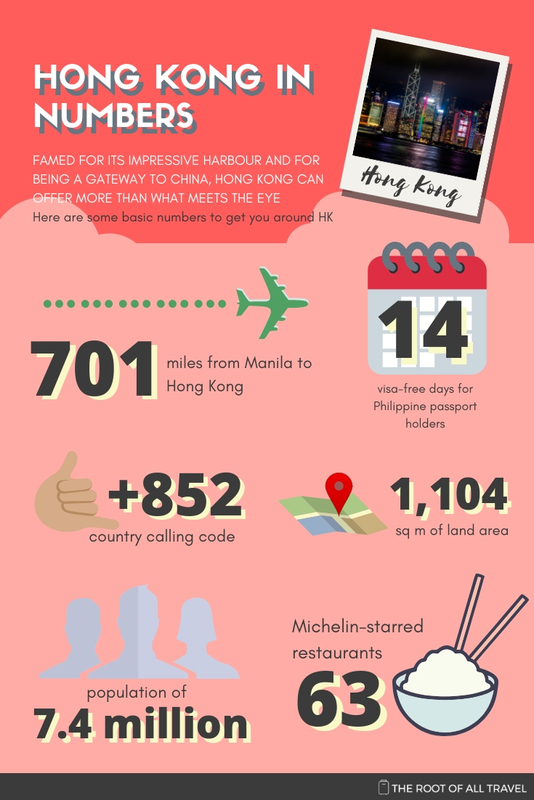 Direct flights from the Philippines to Hong Kong can set you at around PHP5,000 to PHP10,000 for coach and somewhere around PHP30,000 to PHP40,000 for business class tickets. Premium economy class are also common in this route with Cathay Pacific pricing at around PHP20,000 to PHP25,000. The Hong Kong International Airport (or rather known to the locals as the Chek Lap Kok Airport) is one of the top-ranked airports in the world. It is sophisticated, modern and efficient. But let's face it, Hong Kong's location adjacent to the Pacific causes many flights to get delayed or even cancelled especially during the typhoon season (more on climate below). When you happen to be the subject of this inconvenience, avoid the disgruntled crowd and head to one of the peaceful airport lounges. With a Priority Pass membership, you can get into three Plaza Premium Lounges at HKIA. There are a variety of transportation options that operate to and from HKIA. Airport express: The airport is just a 24-minute train ride from the city center. A trip to the Hong Kong station will cost around HKD110-115 for adults and HKD55-57 for children. Using Octopus Cards will give you discounted rides (more about Octopus Card below). With 10-12 minute intervals in between train departures, you’ll be at your hotel doorstep in no time. Public buses: If you are on a budget and find the airport express to be expensive, you may take the public buses. Depending on where you alight, bus ride will cost from HKD3.50 to HKD58. Should you be paying cash, remember to pay the exact amount as payments are dropped on an enclosed box – so no change may be given. For details on the bus routes and operating hours, you may visit the service providers’ website here: Citybus and Long Win. Just like other ultra-modern mega cities, Hong Kong has an efficient public transportation system – in fact one of the best in the world – which makes it easy for travelers, like you and me, to get around. In Hong Kong, carrying an Octopus Card is a must for a seamless and cash-free travel. This card allows you to use all major public transport, as well as to buy at convenience stores and select shops. Costing HKD150 (HKD100 value plus HKD 50 deposit upon return), this can be easily topped up at any MTR station. This also allows you to save some dollars compared to using single journey tickets. To save even more, you may opt to purchase your Octopus Card online from KKday which you will need to pick-up when you arrive at the airport. MTR: Hong Kong’s train system is extensive covering a vast part of the city. While the walkways tend to be very long, it is very easy to navigate with the help of English-translated signs. For instance, a trip from the Victoria Harbour (East Tsim Sha Tsui station) to Hong Kong Disneyland (Sunny Bay station) will take about 33 mins and will cost HKD20-23.50 for adults and HKD10.50-HKD12 for children. Make sure to download the MTR mobile app to plan your journey on the go: iOS or Android. Bus: There also ample number of buses (some are even double-decker) serving the metropolitan Hong Kong. For consistency in sample, getting from Victoria Harbour (East Tsim Sha Tsui station) to Hong Kong Disneyland Resort will set you between HKD35-HKD54 and will take about an hour. Ferry: The Ferry network in Hong Kong is still very much alive today. Take the ferry from the Central Pier across to Kowloon. The experience of taking the ferry offers a different vantage point of the harbor and the buildings surrounding it. Ferry rides are cheap ranging from HKD2.00 to HKD3.40 for adults and from HKD1.40 to HKD2.10. Tram: A cool way to see the city is through the double-decker trams. They’re only available for travel between east and west points of Hong Kong Island. Taxis and ride-sharing apps: Maybe the most convenient mode of transportation has always been the cabs and supplemented by the ride-sharing apps. Be prepared to pay a hefty price for this convenience, though. The Hong Kong Dollar is the currency used in Hong Kong, symbolized as HKD or HK$ interchangeably. Check out the latest exchange rate with your home currency here. Using credit cards is not a problem in this financial hub. You may even chance upon an establishment that accepts Bitcoin. Who knows? Tipping is not common in Hong Kong. When at restaurants, chances are that the service charge is already part of your bill. In riding cabs, you may just simply round up your fare to the nearest dollar. No biggie. May the old gods and the new bless Hong Kong for its free public Wi-Fi. At almost all major tourist attractions and public spaces, you will be able to get Wi-Fi feed from Wi-Fi.HK. The speed is pretty good, too! But if for any reason you want a private Wi-Fi hotspot for your family or your travel group, Skyroam offers unlimited global Wi-Fi which can connect 5 devices. For just USD9.95 per day, you and your travel buddies can have blazing fast 4G LTE mobile Wi-Fi speeds in Hong Kong. As a reader of this travel guide, Skyroam will give you 10% off on your rental by just using the coupon code THEROOTOFALLTRAVEL. Rent your device here now! Now that we’ve covered the essential things and the tricks to help you gear up for a trip to the organized chaos that is Hong Kong, it’s time for us to pin the map for the recommended places to visit in Hong Kong.